We know from personal experience how difficult it can be to find the best toys for kids with ADHD to help enhance and improve their quality of life. Children with ADHD are not just hyperactive and/or lack the ability to pay attention for an extended period of time. They may also suffer from lack of self esteem and anxiety, as well as having other problems that they need to learn to deal with. Many parents of children with ADHD look for toys for their child that may help them to overcome, at least temporarily, some of the problems they have, making life easier for their child. We really want to help make finding these toys as simple as possible. After endless hours of dedicated research, we have handpicked some really good toys for kids with ADHD that may provide some relief or diminish some of the symptoms of this condition. Children with ADHD who tend to be hyperactive usually need more physical activity to help them feel calm than children who are not hyperactive. Indoor and outdoor toys that can help children burn off some of their excess energy may help calm them enough to concentrate for periods of time and make them feel more relaxed. Laser tag is a great way for any child to get a bit of exercise while engaging with their friends. 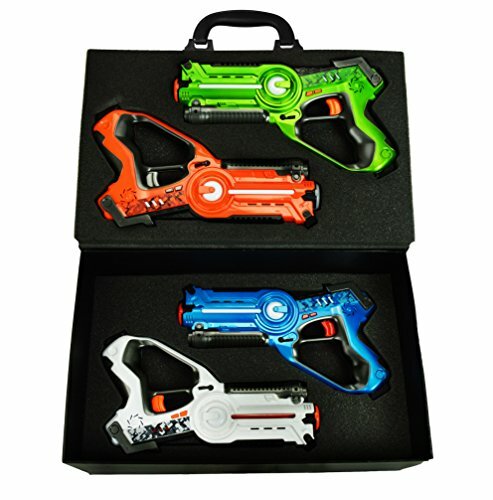 This Dynasty Toys Laser Tag Set and Carrying Case is the ideal Laser Tag Game for small groups. This set comes with four guns that allow you to play as one team, two teams, or as individuals. These Laser guns are Certified Child Safe Class 1. You don’t need any eye protection to play and the blaster (gun) itself is also the target, so you don’t need a vest or other equipment to play Laser Tag. These Laser guns come in four colors; green, red, blue and white and is 100% safe for people of all ages. Each gun does require 4AA batteries and reloading is as easy as tapping the bottom of the handle. Each Laser makes different sounds making it even more fun. It also comes with a carrying case. Although recommended for children ages 10 and up, many parents find their 6 and 8 year olds can use these laser guns without a problem. This Laser set makes a great toy for children with ADHD for a number of reasons. They can use it out of doors and studies show that spending time in green spaces helps to calm children who are hyperactive. Playing Laser tag also gives kids with ADHD a way to engage with other children, building socialization skills and helping them to make friends. This Dynasty Toys Laser Tag Set and Carrying Case is a great toy for children with and without ADHD providing a means to get exercise and burn off energy, while providing hours of fun. If you are looking for a fun toy to help your child with ADHD burn off some of their boundless energy, then the Razor PowerWing Caster Scooter is a great option. This three wheeled trick scooter is propelled by twisting your feet, an action that requires a great deal of energy. The scooter has a steel frame, a Polyurethane front wheel and a pair of caster rear wheels. It comes with removable stability bars, foam handlebars and a foam grip. While this scooter does need to be run on fairly flat ground, it is perfect for allowing your child to perform side drifts, 360 degree spins or perform wheelies. Successfully learning to do tricks may help build self-esteem in ADHD children since they all too often have difficulty achieving any type of success. It comes in sweet pea (pink) or blue and can easily be used by anyone weighing 143 pounds or less. We recommend that you also purchase protection for your child, such as head gear and knee and elbow pads to help ensure safety. The manufacturer recommends this PowerWing Scooter for children ages 6 and up and this seems to be the appropriate age for this scooter to be used successfully. 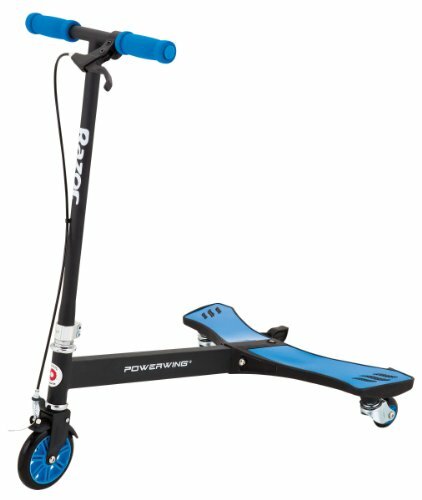 While this Razor PowerWing Scooter is great fun for all children, it does make a great toy for children with ADHD. If your and your children have longed to fly a kite only to be unable to get it and keep it airborn then this Huge Rainbow Kite for kids may be just the kite you are looking for. Flying kites requires children to run, and this is a great kite for kids with ADHD because it’s easy to launch and fly, and comes with its own string and handle. This 42 inch kite is made of non-toxic material body and tail with a kid friendly handle. Despite its size, it’s easy to get off the ground and keep in the air, all you need is a nice breeze. While this kite is great fun for children of all ages, it works exceptionally well for children who have ADHD for several reasons. First, because kids with ADHD often become easily frustrated, being able to get this kite flying easily and simply will allow them to have fun without feeling frustrated. Second, actually flying the kite forces children to concentrate, and the more children with ADHD concentrate, the better able they are to concentrate for longer periods of time. Third of course is the fact, that flying kites requires a great deal of running, which helps to relieve some of the excess energy that children with ADHD have in such abundance. While this kite Is recommended for children ages 3 and up, most parents agree that children under 6 or 7 will need some adult assistance. 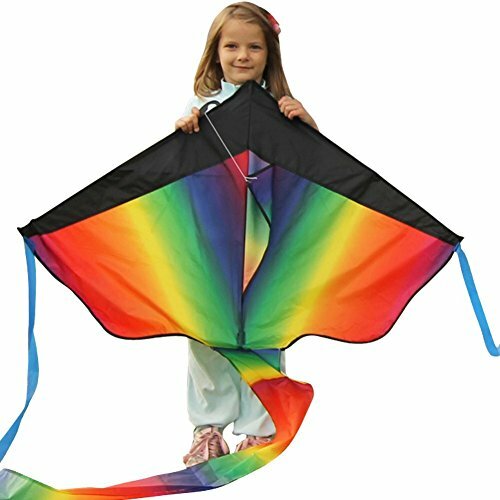 This Huge Rainbow Kite for kids is a great kite for any child, and can provide hours of outdoor fun for both parents and children. If you are looking for a good starter skateboard that allows you to perform tricks, then this Powell Golden Dragon Flying Dragon Complete Skateboard may well do the trick and it’s a perfectly suitable toy for kids with ADHD. This 31 inch skateboard comes with complete with high rebound polyurethane wheels. The board top is easy to grip and the red dragon screen printed on the bottom of the board makes the skateboard look great. For children who just want a board to ride, you will have to invest in softer wheels, as the wheels on this skateboard are harder, making it easier for children to perform tricks. Parents have purchased this skateboard for children as young as 7, however, do make sure that you provide your child with necessary protective gear, such as a helmet, knee and elbow pads as well. Skateboarding can be a good activity for children with ADHD. It helps to burn off a lot energy especially when learning and doing tricks. It also allows children with ADHD to become good at something, which can help them build self confidence in knowing that they can do some things well ,even though other things may be difficult for them. It also allows them to engage in activities that other children enjoy and be able to accomplish the activity just as well. If you are looking for a fun activity for your child with or without ADHD, then this Flying Dragon Skateboard may well do the trick. 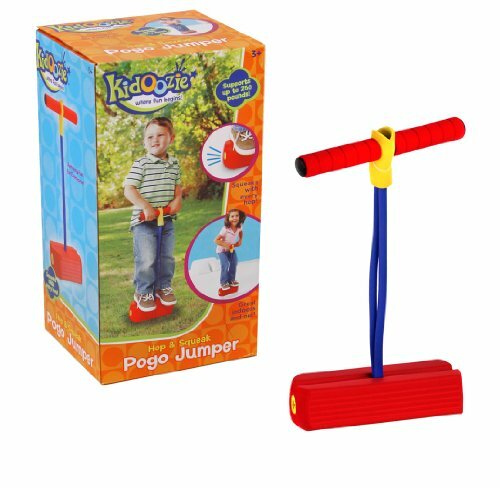 If you are looking for a fun toy to help keep your child active indoors or out, then this Kidoozie Foam Pogo Jumper may be just the toy to help keep your child bouncing for joy. The Kidoozie is like a regular pogo stick, except that it has a wider base, so children (and even adults) can stay on better. It also has a cushioned base making it ideal to use both inside and outside as it won’t leave marks on your floor or making a thumping noise (though it does squeak as kids bounce). Children as young as 3 can use the Kidoozie and so can older children, teens and even adults up to 250 pounds. The Kidoozie may be an excellent choice for kids with ADHD who need to burn off extra energy throughout the day as they can bounce around on this for several minutes before starting their homework, which may calm them enough so they can maintain more focus. It may also be used just before bed and bath time to help children with ADHD feel more relaxed, making it easier to fall asleep. 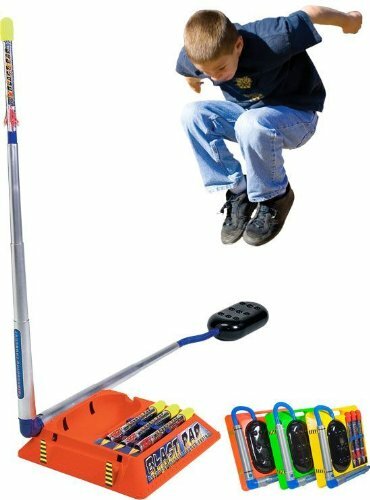 The Kidoozie Foam Pogo Jumper is a fun toy that will get your child exercising and burning energy while having a good of fun. If you are looking for a fun and simple toy that will encourage your child to play out of doors while getting them to engage in a bit of healthy exercise, then the Marky Sparky Blast Pad Missile Launcher may do the trick. This missile launcher is easy to set up and easy to use. To launch the three foam tipped rockets, all children have to do is jump on the launch pad to force air through the hose and fire rockets into the sky. The harder they jump, the more air that is forced through the hose, causing children to run and jump on the launcher to send the missiles higher and higher into the air. Recommended for children age 8 years and up, parents shared that younger children have no trouble using the launcher. Of course they won’t be able to launch the missiles as high as older children, but will have fun trying. As simple as the Marky Sparky is, children (and even adults) seem to be fascinated by it, and parents have reported that their children have played with it for hours at a time. The more a child plays with the blast pad, the more energy they burn, which makes it a great toy for children who are hyperactive, as it helps them to burn off some of that excess energy and keeps them calm for longer periods of time. The Marky Sparky Blast Pad Missile Launcher is ideal for multiple aged children, providing them with a simple and fun toy that provides hours of fun. This Razor Ripstick Ripster is a fun pivoting deck type of skateboard that uses 360 degree caster trucks. 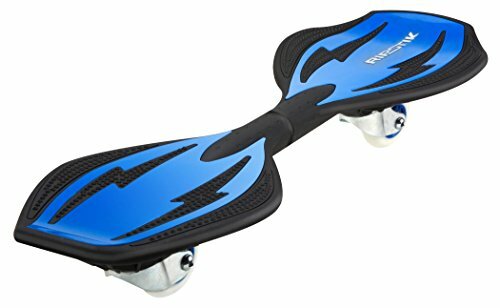 It’s shorter than the original Ripstik and comes in red or blue with removable polymer deck plates, a slip resistant concave deck, and urethane wheels with a rubber padded steel torsion bar. The Ripster measures 27” X 9” X 4.9” and bears weight up to 175 pounds. The Ripster is more exciting than other skateboards because you can accelerate and turn without either foot touching the ground. It can carve like a snowboard and is great for performing all types of other tricks. Mounting and riding the Ripster is a bit different than riding on a traditional skateboard, but there are some great videos on Youtube you can watch to learn how to ride the Ripster correctly. It is recommended that anyone riding the Ripster wear safety equipment such as a helmet, and elbow and knee pads. The Ripster provides great exercise and a way to burn off excess energy which makes it a good choice for kids with ADHD who have hyperactivity tendencies, since it takes a good amount of energy to ride the Ripster. The Ripster also help children who have ADHD improve their concentration as they focus on learning to ride it and do different tricks. This practice on concentrating may help them concentrate in other areas of their life as well. The Ripstik Ripster is a fun and newer type of skateboard that is sure to provide your child with years of entertaining transportation! Children with ADHD often have difficulty paying attention and concentrating which can affect their ability to perform school work, play games with rules, and follow home rules. Parents who choose to treat their children’s ADHD naturally often look for toys that can help their child reduce their attention deficit symptoms and increase their ability to concentrate. Studies show that many children learn better when they can be physically doing something while listening and learning. Fidget toys were invented to help children keep their hands occupied, relieving their need to fidget and helping to calm anxiety and stress. Tangle Junior is one of the original fidget toys and is an excellent option for both children and adults. They are especially helpful to children who suffer from ADD, ADHD, or other anxiety issues, allowing them to focus better when their hands are occupied. 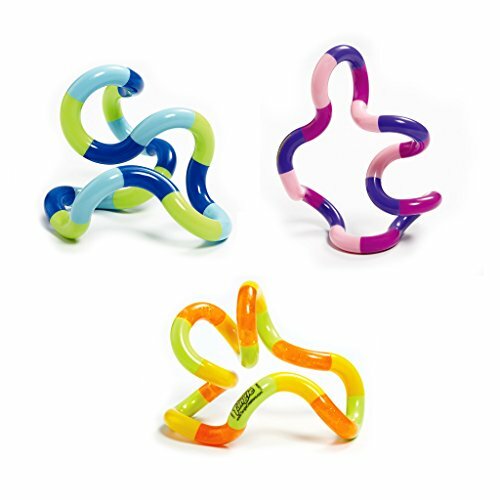 This set of Tangle Jr. Fidget Toys comes in a set of 3. These toys are designed to take apart and put back together, over and over again. You can also twist this toy in different ways. Tangle Jr. is extremely quiet, making it perfect to hold, twist and manipulate without causing a commotion in the class room, library or other places. where maintaining quiet is essential. Several teachers and parents shared that children who use the Tangle Jr. during class or homework time are calmer and fidget in their seats less. Some parents even said that after supplying their children with Tangle Junior, their grades even tend to improve. While this toy is recommended for children age 3 and up, it is best to be sure that your child is old enough not to put things in their mouth. If you have a child who has difficulty focusing, then providing them with Tangle Jr. may well help your child feel calmer and more focused. Frick Frack Fidgets come in a set of 10 and in colors green, yellow, red, blue and purple. They are specifically designed for children and adults who suffer from ADD, ADHD, OCD, Autism, and anxiety and stress issues. 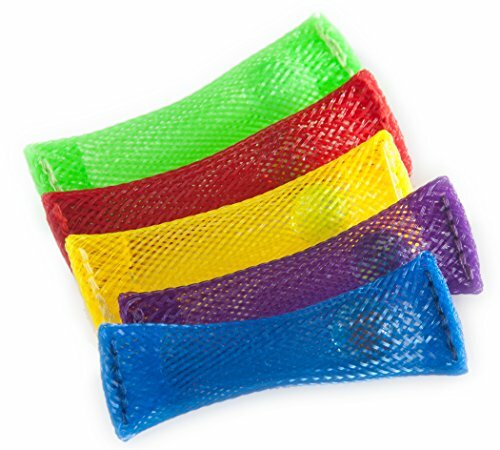 Frick Fracks are a simple toy that consists of a completely enclosed nylon sleeve with a marble inside. The idea is that moving the marble back and forth inside the nylon sleeve helps to improve focus and keep people calm. These Frick Frack Fidgets are extremely quiet and people can play with them even while still in a pocket. Teachers find that giving them to children who show signs of fidgeting in class or anxiety helps them focus and concentrate better without disrupting other class members. It also seems to help students who suffer from ‘test stress’, helping them to do better on tests or exams. In some cases, the stitching on these Frick Fracks come loose so these toys should not be given to children who may put the marbles in their mouth. Some parents shared that they solve this problem by reinforcing the stitching on these Frick Frack Fidgets to make them a little more durable. These Frick Frack Fidgets are a simple calming toy that can reduce stress and anxiety while improving your child’s focus and classroom performance. They are great stress buddy toys and relatively inexpensive so very easy to replace if they get mislaid or lost. 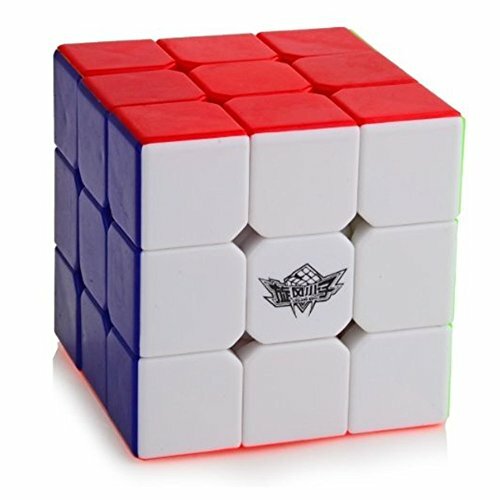 The D-FantiX Cyclone 3×3 Speed Cube is designed like a rubix cube puzzle with a few handy improvements. The bright colors on the squares are not stickers, but permanent, which means the colors will not peel off. The cube is made from Eco-friendly ABS material that is non toxic and lightweight. This speed cube is easy to turn and doesn’t pop as easily as many other puzzle cubes. It also cuts corners well for faster solving. The D-FantiX is recommended for children ages 3 and up, but children younger than 6 may not be able to actually solve the puzzle, but will enjoy turning the sections. Turning the sections of the cubes has a calming affect on many people, even when actually solving it may prove difficult. The fact is that this puzzle cube turns easily makes it less frustrating than some of the other cube puzzles. Because this cube does not use stickers, makes it a good puzzle cube for children with ADHD as well as younger children, who have a habit of picking at objects and are likely to pick the stickers off the puzzles. With this puzzle, picking off stickers is not an options since the colors are permanent. The D-FantiX Speed Cube is a fun puzzle toy for all children that may provide some additional benefits to children with ADHD or anxiety issues. 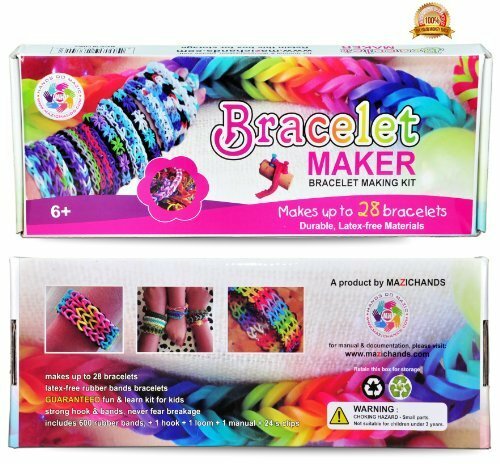 This Mazichands Bracelet Making Kit is a nice rubber band bracelet kit that allows your child and their friends to make up to 28 rubber band bracelets. This bracelet making kit is an ideal activity for both girls and boys that allows for creativity while keeping their hands busy. It helps calm and relax children who are suffering from stress or anxiety. This kit includes 24 C clips, 1 hook, Loom, and 600 latex free rubber bands, as well as an instruction manual. The kit makes 24 to 28 bracelets and you can purchase refills of rubber bands to allow for the making of even more bracelets or rings. Along with the instruction manual, you can also get videos online that shows how to make other bracelet styles. Studies show that when children work with their hands, they tend to feel more relaxed and calm and can focus better. By being able to make bracelets, children will be working with their hands while practicing following directions and focusing, which makes this kit a good activity for children who have ADD or ADHD with difficulty in focusing. This bracelet making kit is recommended for girls age 6-10, but several parents shared that boys like making these bracelets as well. Allowing children time playing with this bracelet making kit as a reward for successfully completing their homework or as rewards for focusing in school can work really well. Overstimulating activites such as video games, may make some symptoms of ADHD worse. This Mazichands Bracelets Making Kit offers children who have ADHD or anxiety issues an activity that actually helps to calm them while giving them a fun and creative activity they enjoy. Some parents may feel that giving their child with ADHD a Perplexus is unwise because these are difficult puzzles to solve. However, this is actually what makes them a good choice for kids with ADHD because they will see other people struggling to solve this puzzle and won’t feel so different or frustrated when they find it difficult. There are several Perplexus puzzles to choose from and the Perplexus Original is a good place to start. Perplexus Original is a 3-D Maze puzzle inside of a clear globe. This puzzle consists of 22 feet of track with 100 challenge barriers that you need to get the little ball past. 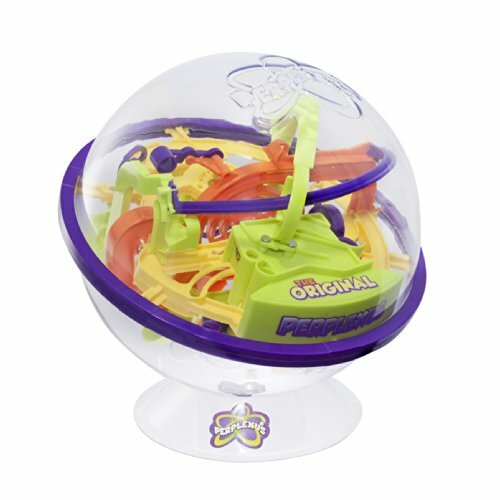 This Perplexus has three different puzzles in one, and you need to twist, turn and flip the globe to keep the little ball on the track. While the puzzle is recommended for children age 8 years and up, there are several other versions that are suitable for all ages. Although this puzzle is easy to use, it is difficult to master, which may seem as though it would not be suited for children with ADHD who have a difficult time dealing with frustration. However, children with ADHD actually feel a real sense of accomplishment as they get further and further along track. This puzzle is addictive, so children with or without ADHD tend to pick it up over and over again to try and solve it. In addition, the working of the puzzle may actually have the affect of engaging both their hands and their brains, resulting in some relief from their feelings of anxiety. It does come with a stand to sit the Perplexus on when the puzzle is not in use. The Perplexus Original is a great family puzzle that everyone can enjoy, including children who have ADHD who may not be drawn to other puzzles or family type activities. Jenga is a great game that children can play by themselves or with others. The game consists of 54 hardwood blocks that are stacked into a tower. This puzzle game can be played alone or with a group of people. You set up the puzzle by stacking the blocks 3 wide in alternating directions for each layer. The object of the game is to remove one block at a time from the tower and place it on top, without causing the tower to fall down. The more pieces that are removed and restacked, the greater chance that the tower will fall. Jenga is a great game for the entire family, and children who have ADHD may really find this game beneficial, as it can help them work on their socialization skills as well as their concentration. In addition, these Jenga blocks can be used to build different types of creations, allowing children to engage both their focusing skills and their creativity. Jenga is recommended for children ages 8 and up, but children as young as 5 or 6 can play since the rules are simple. The tower may fall sooner, but as your child becomes more skillful, the tower will stand for longer periods of time. It can often be difficult to find a fast paced game that ADHD kids can enjoy, but Jenga is just such a game, as moves are quick and the game takes only a short time to set up. 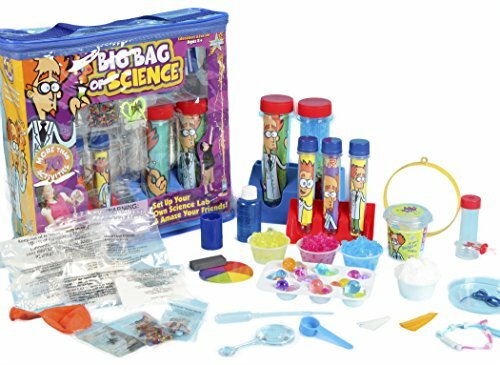 This Be Amazing Toys Big Bag of Science contains 70 fun science activities and experiments with step by step instructions for completing each experiment. These experiments are designed for children age 8 years and up, but with parental assistance can be used with younger children. The experiments provide children with hands on fun and learning. This gives children a way to absorb many STEM principles outside of the classroom setting in an active way. Performing experiments themselves can help ADHD children practice their focusing skills, and allow them to experience success in completing a task and seeing the actual results. Studies also show that ADHD kids focus better when they are interested in a subject, and these experiments may create an interest in science for any child. It should be noted that there is a list of other materials that will needed for your child to accomplish all of the experiments, but these materials are listed in the front of the book. This is a great way for children to learn how different things work, and the experiments make working with polymers, and making slime and snow, tons of fun! This Big Bag of Science is the ideal gift to create an interest in science for children with or without ADHD. Keep in mind that children with ADHD can play with any toy that any other child plays with. The toys you choose should depend on your child’s interest. If a child has a real interest in a specific toy, then they will be able to concentrate better. This will help them to learn the skills that are required to play with the toy. Don’t feel you have to limit your child to the toys on this list. We’ve used our personal experience with ADHD kids to handpick these particular toys. We know that those kids loved them, really enjoyed playing with them and that they helped them significantly with their ADHD symptoms. For us, it’s about choosing the right toys that will enhance a child’s life, so we hope you’ll find the perfect toy or gift for your ADHD child.